Have you ever had “cauli-rice?” Have you ever even heard of such a thing? I hadn’t until I started looking for recipe alternatives for my favorite homemade dishes. Cauli-rice, or cauliflower rice, is simply cauliflower that has been chopped into small pieces to resemble, you guessed it, rice! Cauliflower rice is a great alternative to regular rice, because you can do the same things with it that you would normally use with rice. 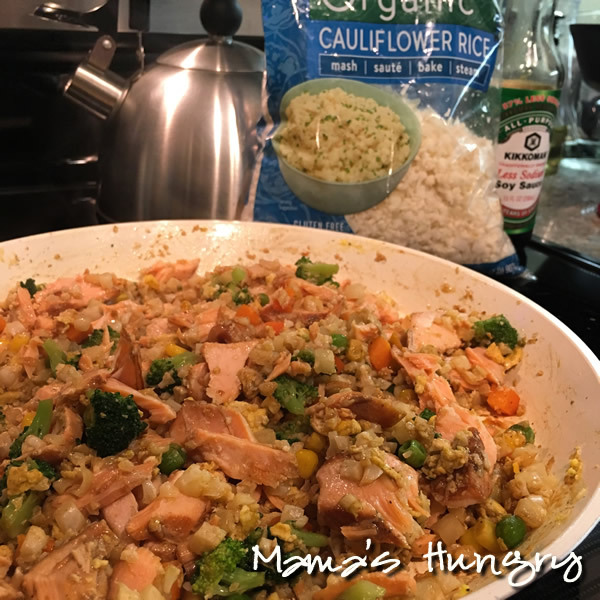 Below is a low-carb recipe for cauliflower rice with vegetables, asian flavors, and fresh pacific salmon. I used leftover salmon I had from the previous night’s dinner, but you could totally just grill a fillet or two, or even buy some already made and make it even easier! You can also use a totally different protein altogether, if that’s what you have on hand. Any leftover chicken? Toss it in if you don’t have any salmon! Friday night’s pork chop? Dice that bad boy up and toss him in; he’ll have a blast and so will your taste buds! A low-carb recipe for cauliflower rice with vegetables, asian flavors, and fresh pacific salmon. Cauli-rice is a great alternative to regular rice. If you don't have access to Cauliflower Rice at your local Costco (were I find it), you can easily make your own. Steam cauliflower until fork tender, and chop in a food processor until it resembles the consistency of rice. If you are following a super low-carb diet, please leave out the carrots and peas. They are higher in carb count than other veggies. Start with a non-stick pan on medium. Let the pan get nice and hot before you do anything. This will take 2-4 minutes depending on your stove. Let them cook for about 2-3 minutes. You don't want them too soft, or they'll turn mushy when you add the soy sauce. Add the Ginger and Garlic. Stir to combine, and cook for 1 minute. Add the Cauliflower Rice. Cook for 2 minutes. Push everything to once side of the pan, and add a scrambled egg to the side of the pan without ingredients. Stir the egg until fully cooked, and then reincorporate into the mixture. Turn up heat to Medium-High. Add the Soy Sauce, and sprinkle in the Sesame Seeds. As always, if you decide to make this recipe, please come back and share with me! I like these kind of dishes where all the macronutrients are mixed into one bowl. 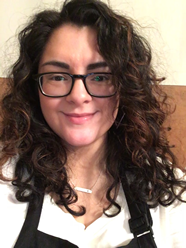 I grew up on white rice but being low carb now, I use cauliflower instead. I don’t need it in rice form, I just cut them into small chunks and eat them like that. OMG best recipe ever, used smoked salmon last night I will do again with leftover smoked chicken and down the road I can envision this with shrimp. YUMMY!!!!! Previous post: Chocolate, Peanut Butter, Coconut Oil, oh my!